Because Akeem is delivered to us wearing his accessories in package, we're going to take a look at his accessories first. He only includes two: a hat and oversized African(?) entrance shirt. His hat, or Fez, is molded in blue rubber with the opening slightly molded to narrow at what would be the front to better fit the shape of Akeem's head. The stripes on the fez appear to be tampos and unfortunately weren't done very well. The paint is thicker where each section of the stripes overlaps the previous, but the middle of each section is weak and the blue plastic shows through. Even worse, most of the stripes have chipping paint at different points. It doesn't look to bad from the front and on a shelf full of other Legends, may not be noticeable at all, but if you look at him from the side or back, it's really obvious. While the red stripe features the best application, it too has a few chips in it. Maybe this is why Mattel didn't attempt to add the black detail lines on Vader's mask. On the other hand, the entrance shirt is really nicely done and makes up for the lackluster headgear. The shirt is constructed much like a real shirt, stitched down the sides and featuring a hemmed collar. It's made of a nylon-type material and unlike the t-shirts we regularly see in the Elite and Legends lines, this one does not open in the back. You have to slip it over Akeem's head. It is loose-fitting, but definitely take your time when removing the shirt to make sure you don't tear it. Akeem's head sculpt is fantastic, as usual for the line. His head and hair are one molded piece and there is plenty of great sculpted detail all around. While his hair is kind of curly and unruly, it's flattened on the top, simulating "hat hair" after wearing his tight-fitting fez to the ring. 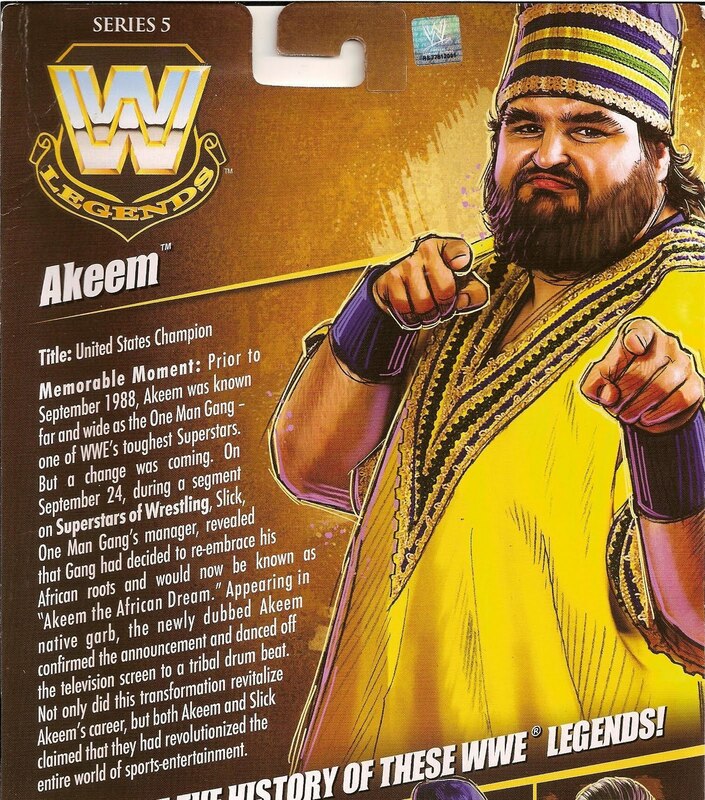 I'm not sure if Mattel was going for the expression Akeem displays on the card art, but the figure seems much more pissed off. It's still a great likeness. Once you're past Akeem's entrance attire, you're treated to a fantastic figure with lots of new tooling involved. 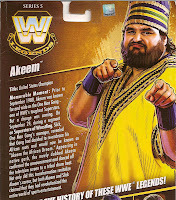 First up, Akeem is the biggest (i.e. fattest) figure in the line to-date. He utilizes a new torso sculpt that is wider and deeper than Bam Bam Bigelow's. The same goes for the lower torso (crotch/buttocks) piece. His legs are also bigger than Bam Bam and at first I thought he reused Dusty Rhodes' cowboy boots, but despite being very similar, Akeem's are brand new tools! The only reused parts I can spot on Akeem are his arms. Those have seen plenty of use on BBB, Dusty, Vader, Kamala and probably a few non-super-heavyweights, too. The paint work on Akeem's ring attire is mostly good. A few spots run into some trouble similar to what happened with his fez. Most notably the striped section around his mid-section. Just like on the hat, Mattel tampographed the stripes in sections with the ends overlapping. The yellow lines are faded and the blue of his tights shows through. This is especially obvious on his back. Most of Akeem's parts are molded in the necessary color, however, his shoulders were molded in his flesh color then painted blue. The application was smooth, so there's no fear of the paint rubbing off because of the joints. The stripes on the arms were applied much better than those on his hat and waist. There is a bit of fuzziness where the red stripe meets the blue sleeve, but nothing major and barely noticeable unless you're looking at him up close. The stripes along his collar and the triangluar designs on his legs all look great. My figure has a couple of chips on the upper left hip and some of the mold flash didn't helpt the paint there either. Akeem features an outline of the continent of Africa on his back with his name printed inside. It's stamped in yellow, so it's a bit weaker over the blue background, but still clear enough to make out and features a nicely detailed shape. The boots are molded in a pasty yellow plastic with the soles painted in a more muted yellow color. The straight sections down each side of the boots are painted red and each feature "AKEEM" or a heart and arrow design on them. Both are printed clearly and look great on the boots. You would be hard-pressed to find a diehard Akeem fan and I wouldn't call his run in the WWF epic, but I do remember him well and I'm sure many fans of '80s WWE will to thanks to his silly entrance dance and overall size. Akeem is a great Legends figure that was short-changed on paint applications. For $15+ figures, that's really not acceptable. I picked him up at Toys R Us for $12.99 plus tax and at that price I can let the minor paint problems slide. Hopefully, you can find him for a similar or better price and add him to your collections.